Basic concepts in cognition and aging (E.A. Lovelace). Automaticity of encoding and episodic memory processes (D.H. Kausler). Adult age differences in memory for pictures and images (A.D. Smith and D.C. Park). Aging and attention: Selectivity, capacity, and arousal (D.J. Plude and J.A. Doussard-Roosevelt). Age-related deficits in cognitive-motor skills (N.L. Goggin and G.E. Stelmach). Aging and metacognitions concerning memory function (E.A. Lovelace). I believe, therefore I can: Self-efficacy beliefs in memory aging (J.C. Cavanaugh and E.E. Green). Memory interventions in aging populations (S. Kotler-Cope and C.J. Camp). Current issues in cognitive training research (S.L. Willis). Aging and word retrieval: Selective age deficits in language (D.M. Burke and G.D. Laver). The way reading and listening work: A tutorial review of discourse processing and aging (E.A.L. Stine). Adult age differences in traditional and practical problem solving (N.W. Denney). Interactions between personality and cognition and their implications for theories of aging (D.P. Gold and T.Y. Arbuckle). Intellectual abilities and age: Concepts, theories and analyses (W.R. Cunningham and A. Tomer). Cognitive aging : A summary overview (E.A. Lovelace). Author index. Subject index. 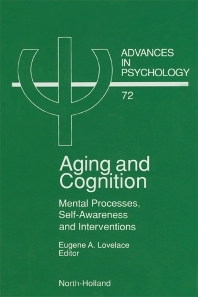 Presented in this volume is a discussion of current literature and theoretical issues relating to three aspects of late-life age-related cognitive change. Firstly, evidence regarding aging and the basic mental processes of attention, motor control, memory, language, problem-solving, and intelligence are presented. Secondly, the role of personal traits such as personality and self-efficacy in the aging of cognitive function are developed, along with self-awareness of cognitive processes and age changes in the monitoring of these processes. Thirdly, consideration is given to the study of interventions to delay or remediate the cognitive declines of aging.